One thing I really struggled with before going zero-waste was hydration. I simply did not drink enough water throughout the day, leading to the unsound health of my mind and body. Now that I live a zero-waste lifestyle, I have my mason jar or reusable water bottle with me at all times. I can happily say that I have cultivated a new and healthy routine around drinking liquids. To stay hydrated, I make a soothing tonic with one of my favorite herbs--Ginger-- and a few other incredible ingredients that keep me focused and feeling energized throughout the day. Seriously, if you're feeling a cold coming on, your tummy is upset, or you need a boost, this ginger drink may very well do the trick! Combine the ingredients and then add hot water and stir. You can also make this drink iced during the summer months if you prefer. Ginger: An aromatic herb that has anti -viral, anti- fungal, and anti-inflamitory properties. It aids in digestion, blood circulation, reduces risk of cancer, reduces blood pressure, and is a great cure for the common cold and nausea. Turmeric: Curcumin is the active ingredient in turmeric, and it has powerful anti-inflamatory effects. It's loaded with antioxidants and can be used as a stomach soother, to ease menstrual cramps and improve liver function. Lemon: Each lemon is packed full of vitamins (C, B-12, Thiamin, Riboflavin), nutrients and minerals (copper, calcium, magnesium, iron, potassium). Drinking lemon juice can help to control high blood pressure, aid in digestion and constipation, provide relief from fevers and cold, as well as help balance our body's PH. Cayenne pepper: Has anti-inflamatory properties and can relieve joint pain. It also aids in digestion, helps to boost the immune system, reduce body weight, ease a sore throat, and so much more. Cardamon: Can help the body sweat out toxins and boost the digestive system. Hot Tip: I do ginger shots. If you think taking a shot of alcohol is rough, then brace yourself, because ginger will kick your A**. It's a shot worth taking, and it gets easier. Having a chaser like apple juice is a good idea if you're squeamish. 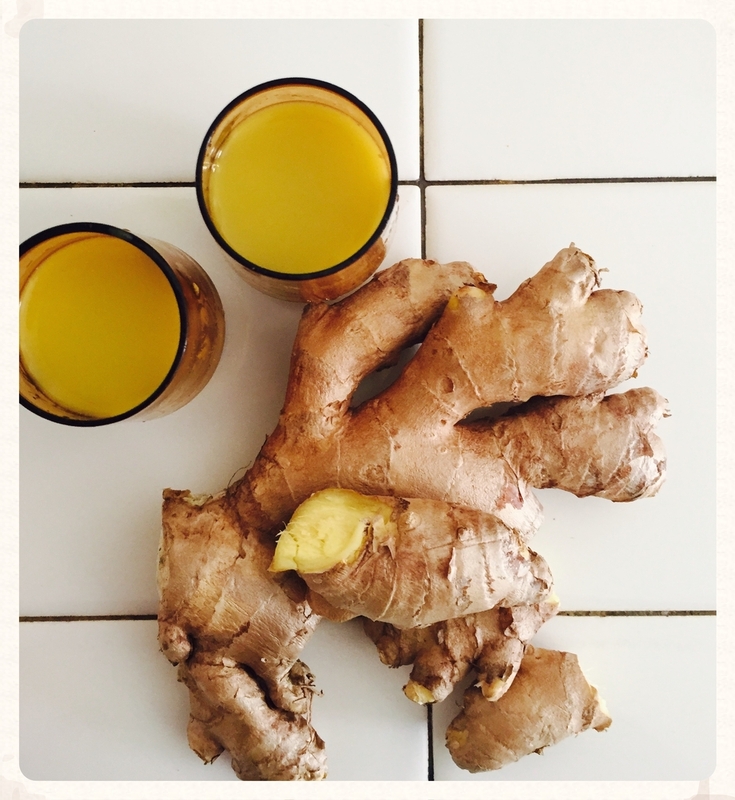 How to make ginger juice at home. 1. You can peel the ginger (I recommend this if it's not fresh). 2. Chop the ginger into small cubes, place in the blender, and add water. 3. Blend until liquified. 4. Strain the juice through a cheesecloth. This extracts the pulp (fiber is lost, but I save this to make banana ginger muffins). The less water you add, the more concentrated the ginger juice will be.